Independent crank arms for increased selection of motion to maintain consumers engaged. Ergonomically developed saddle allows straightforward transition amongst seated and standing exercising positions. Adjustable crank arm height encourages higher variety of muscle activation. Crank and flywheel assembly rotates to accommodate forward and reverse movements. Slim crank axis makes it possible for for greater RPMs, growing velocity and endurance. Detachable seat for wheelchair accessibility and superior movements. The Johnny G Krankcycle by Matrix features independent crank arms that offer a wide variety of movements to keep users engaged. The crank arm height is adjustable and the crank-and-flywheel assembly rotates to enable forward and reverse movement. Available either with or without the ergonomic saddle to allow for wheelchair accessibility. Kranking increases aerobic capacity and upper-body strength, burns calories and builds core stability. LED console display is easily navigated by users of all experience levels. Ergo Form seat and back pad enhance comfort and support. Step-thru entry for easy access. Low-watt starting resistance is ideal for beginning, rehab or deconditioned users. Intuitive LED console screen. Integrated 3-speed fan. Integrated wireless knowledge transmitter for use with Asset Management Technique. Modern command seating place guarantees a easy and cozy exercise. LED console display is easily navigated by users of all experience levels. Innovative command seating position ensures a convenient and comfortable workout. Step-thru entry for easy access. Pivoting arm rest for maximum comfort. Intuitive LED console display. Compatible with iPod for charging. Integrated 3-speed personal fan. WiFi enabled for use with Matrix Asset Management system. Innovative command seating position ensures a convenient and comfortable workout. Step-thru entry for easy access. 41 cm / 16˝ class touchscreen LCD display with FitTouch Technology for intuitive performance. Vista Clear Television Technology -- the most vibrant picture quality in the industry. Compatible with iPod – as well as other popular smartphones and tablets – for video and audio playback, charging and on-screen playlist selection. Compatible with iPod for video and audio playback, charging, and on-screen playlist selection. Integrated 3-speed personal fan. 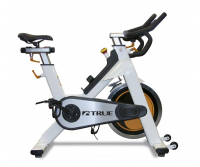 TRUE’s User-Friendly Bike is Customizable & Comfortable Training for your next bike event just got easier: Simply slide your feet into the pedal straps and go! The Indoor Cycling Bike is equipped with a variety of adjustments, allowing users to easily customize the seat and handlebar position for maximum comfort. 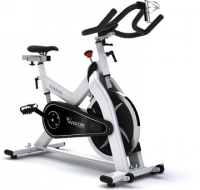 The V-Series indoor cycle by Vision Fitness delivers uncompromised performance.